Several weeks ago we had to call the vet out because Molly was "off". He came out to the farm and determined that she was bloated. For whatever reason her rumen was thrown out of whack and she bloated... poor thing. Between vet visits, calls to neighbors, research online, and trial and error, I learned a lot about preventing and treating this common problem. Bloat is the accumulation of gas in the stomach. If it's not treated, it will become quite serious and cause the animal to die. 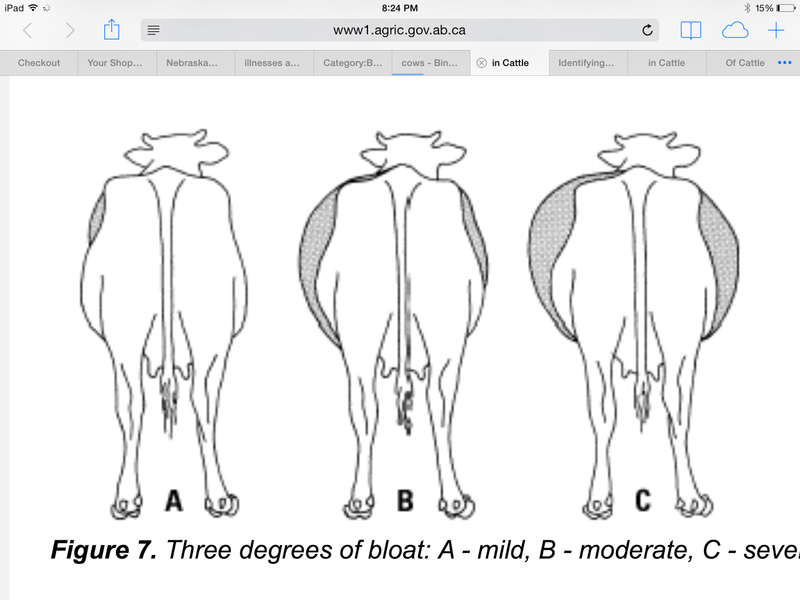 There are two types of bloat in cattle. Frothy bloat (also know as pasture bloat) is caused when gas production exceeds the rate of gas elimination. The rumen continues to function, creating more gas that foams and builds up in the stomach. It is generally associated with grazing on legume pastures like alfalfa or clover. Free-gas bloat is when the cow is unable to release gas (belching) and the gas builds up until the animal can no longer breath. This type of bloat is usually caused by an obstruction of the esophagus, grain overload (acute acidosis), or the rumen stopping it's muscular contractions. As a cow bloats, the left flank will become distended. As gas builds, it will become more difficult for the animal to breath. Open-mouthed breathing and grunting, frequent urination, and possibly even vomiting are all signs of serious bloat. Death may occur within 1 hour of showing signs, but is more common after 3-4 hours. Treatment depends on the type and severity of bloat. In the instance of free gas bloat, a stomach tube can be used to release pockets of gas. While this will temporarily relieve bloating, it is important to know the root cause otherwise the bloat may reoccur. Frothy bloat may also be relieved with a stomach tube, although an anti-foaming agent must be administered into rumen through the tube. In case of emergency, a trocar and cannula can be inserted into the rumen through a small incision. ~ Fill cattle on dry roughage or grass pasture before turning out on a legume pasture. ~ Avoid letting cows on pasture that is wet with dew or rain. ~ After illness or administering antibiotic, use a probiotic to correct the rumen. ~ If adding grain to the diet, start with small amounts. ~ Provide a bloat block (similar to a mineral block). ~ Once cattle are turned out on pasture, do not remove them at the first sign of rumen distention. Mild, resolving bloat occurs frequently and repeatedly on alfalfa pasture. Animals will not be distressed, and will continue ruminating (chewing their cud.) Moderate bloat may be resolved by simply keeping the animal moving until the bloat dissipates. Cattle with greatly distended rumens should be removed from the pasture and treated immediately.